In Home Care or Assisted Living: Which is Better? In-home care vs. assisted living can be a difficult choice. Many families faced with the decision on which is best for their aging loved one might not even be sure of the differences between the two. Determining the best place for aging parents or loved ones to receive the care they need to live a vibrant and independent life will depend on individuals needs and care requirements. With in-home care, a caregiver is hired to come into the home to help with activities of daily living. Home care offers companion care and personal care services to help seniors maintain their freedom and independence so that they may continue living safely at home. Assisted Living Facilities can also be great options for seniors who need help with some of the activities of daily living. These are communities in which seniors live in rooms or small apartments. These facilities offer safety and security in knowing that assistance is always just a phone call away. But they also promote privacy and independence. In-home care allows your loved one to live safely in their own home, whether that individual needs some assistance to live independently, is recovering from a medical illness or surgery, or is an adult who has special needs or disability. If your loved one needs non-medical support and services, an in-home caregiver can be a family member or a trained professional. In-home care providers can adjust their non-medical services based on your loved one needs. Care can be day-to-day, overnight or scheduled care throughout the week. If your loved one just needs support around the home, services can include help with light household chores, such as laundry and vacuuming, as well as other tasks that help maintain a safe and healthy living environment. If your loved one wants to live at home but needs to reduce the amount of driving they do, an in-home caregiver can provide transportation to run errands, doctor appointments or social events with friends in the community. In-home caregivers can provide one-to-one care and individualized attention. Care is customized based on the family’s needs and can be adjusted as your loved one ages. In-home care provides peace of mind to family members who do not live close by. They can feel confident that their senior who is living independently is receiving the personal and companion care they need. If the caregiver is a family member, caregiver burnout can happen. Without a respite care strategy in place to support the primary caregiver, it can impact not only the aging loved one, but the entire family. If 24-hour care at home is needed, hiring a professional caregiver it may not fit within the budget, and thus more responsibility falls on local family members. Your aging loved one may outlive their home and it may be difficult to make modifications inside the home to adjust to the changes in mobility that happen with aging. If your loved one needs more daily socialization and ongoing interaction, assisted living facilities create a communal living environment and provide on-site activities so your family loved one isn’t living alone. If you’re concerned that your loved one isn’t eating properly, assisted living facilities provide healthy meal options to ensure proper nutrition. Meals are prepared and served in a common dining area to further support socialization; however, some facilities have kitchenettes in their individual suite or apartment, so your loved one has the option of preparing some of their own meals if they choose. Assisted living facilities provide a turnkey solution for potential maintenance or other issues that arise within an apartment or suite. Many facilities provide their own group transportation services for shopping, excursions and community events. Doctors, nurses and other geriatric professionals are always on site and the level of care can be expanded upon as needed. Most aging family members want to remain living at home. Additionally, moving could be extremely stressful and the family member may not adapt to their new living environment very easily. The costs associated with moving to an assisted living facility may be too expensive. If the facility does not offer more advanced levels of care, the family may need to move their loved one to a nursing home when their conditions deteriorate beyond a certain level of dependency. 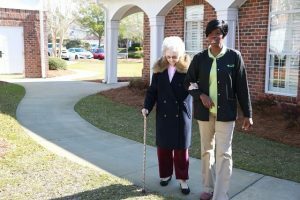 One-to-one care and personal bonding may not occur if the assisted living facility has a high staff turnover rate. If you want your family member to have more personalized care, it could cost more. There will always be specific benefits and challenges to consider when determining if your loved one should stay in their home or if they should move into an assisted living facility. Each family is different and the needs of their loved one will vary based on physical limitations, social desires, and personal motivation. When a family needs to determine the best place for a loved one to live, it’s important to weigh the financial concerns, family availability, the personalized care the individual needs, their desire to move, and much more before making any change. What are your thoughts? We’d enjoy your feedback. Please comment below or join our ongoing conversation on in-home care and other options outside the home on our Facebook page.